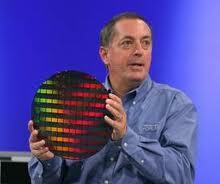 Intel CEO Paul Otellini will step down from the top spot at Intel. Continuing the tradition of transferring leadership at the annual board meeting, Paul Otellini will step down as Intel CEO in May. The new CEO has not yet been named, but Intel’s board of directors is looking at both internal and external candidates. Otellini, the 5th CEO of Intel since its founding in 45 years ago, took over from Craig Barrett in 2009. Otellini has been with Intel almost since its founding and has distinguished himself over his 40 year career at the electronics pioneer. He has managed several Intel businesses, including the company’s PC and server microprocessor division and the global sales and marketing organization. Most recently, in 2002, he was elected to Intel’s board of directors and promoted to president and chief operating officer. He was named CEO in May 2005, a role in which he has focused on driving the company’s growth and mission to deliver innovative, energy-efficient products. Otellini’s has been key to delivering Intel into the new on-line eco-system where portable wireless computing is available anytime, anywhere. He has also driven the mission of creating and providing affordable computers to the next billion users. Barrett became the 4th CEO in 1998 and held that position for seven years. His tenure at Intel started in 1974, just one year prior to Otellini. Barrett started as a manager, and ten years later in 1984 was promoted to vice-president. Three years later, he was again promoted to senior vice-president. After another three years, in 1990, he was made executive vice-president. He was elected to the board of directors in 1992 and made the COO the following year. In 1997 he was named the president and was promoted in 1998 to CEO. The 3rd CEO was the first not to have been founder, even though he was there from the start of the company. Andrew Grove started as the COO where he oversaw all management functions. In 1979 he became the president and then the CEO in 1987, nearly 22 years after joining the start-up. Grove held this position the shortest of all five CEOs, relinquishing after just one year due to health complications. Intel’s first two CEOs were the original co-founders, Robert Noyce and then Gordon Moore. Noyce has the honor of being both a founder and the first CEO of Intel, in 1968. He was in charge of the company until 1975 when he transferred the helm to Gordon Moore, the second CEO.